A lot of people don't like to travel during Christmas because they want to keep family traditions going and sometimes that can be difficult on the road. I have put together a few family traditions that can be taken with you anywhere so you can keep traditions alive while traveling. Advent Calendar Books are easy to carry with you while you travel and they bring a little piece of home to wherever you are. Our family reads "The Advent Storybook" every year and no matter where we are, we read it and the girls LOVE it. It's probably their favorite Christmas tradition. There are loads of Advent books, so choose the one that works best for your family and go! I know there are a lot of people who don't love The Elf on the Shelf but our girls love our elf. We made it a point to have a 'nice' elf that does nice things and gives the girls assignments to do nice things, but whatever works for your family is great. These elves are super easy to pack and fun to set up in hotel rooms or Airbnb's. While Ava was in the hospital we started using Christmas pillow cases because we wanted to bring Christmas to the hospital and we have been using them ever since. 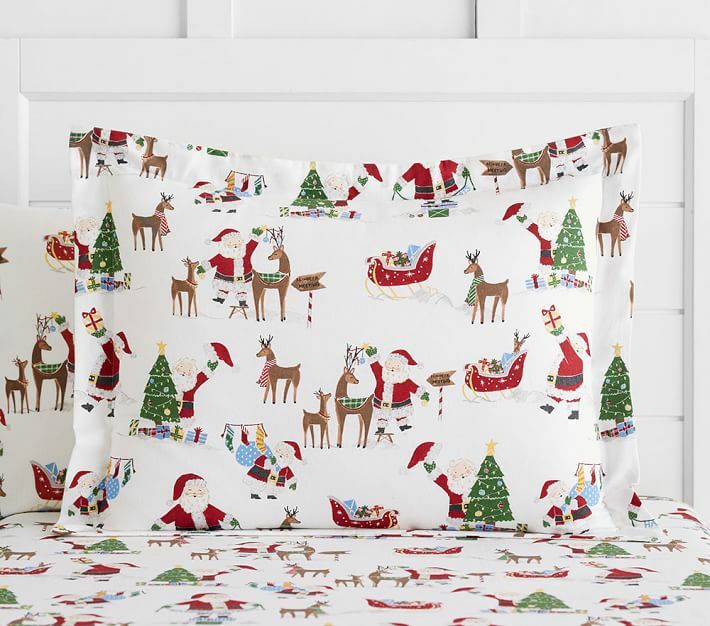 Christmas pillowcases are super easy to pack and slip on your kids pillow no matter where you are. They are also a very fun way to bring Christmas to any place you are staying. DIY Christmas tree star. Last year we let the girls make their own Christmas tree star for our Christmas tree and they thought it was the coolest thing ever! So, this year we decided to make it a tradition. Ava and Tay wanted to make their own star this year instead of making one together so I guess our tree will have 2 stars, but its still a fun tradition. This is an easy way for kids to be involved in decorating and keep them busy during a long car or plane ride. There are a lot of other ways to keep traditions alive on the road. How to you keep your family traditions going while traveling during the holidays?